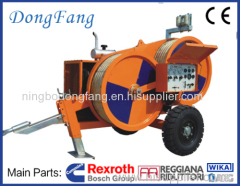 Overhead Transmission Line Stringing Equipment is used for overhead Power Line Stringing operation and Maintenance work. 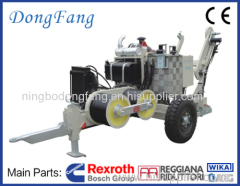 The equipments are composed of hydraulic cable pullers and tensioners, engine powered winches, cable stringing blocks, anti twist wire ropes, hydraulic press, hoists, come along clamps, socket pulling grips etc. 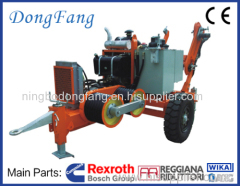 Ningbo Dongfang Machinery of Power Co., ltd. is a good quality and leading manufacture in China. 1000 KV Overhead Transmission Line Stringing Equipments are used for 8 conductors stringing, with 42 ton Hydraulic puller and 36 Ton Tensioner. 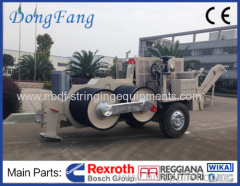 800 KV Overhead Transmission Line Stringing Equipments are used for six conductors stringing, with 30 ton Hydraulic puller and 24 Ton Tensioner. 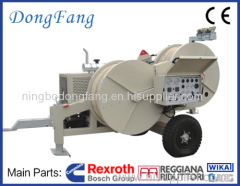 750/765 KV Overhead Transmission Line Stringing Equipments are used for six conductors stringing, with 25 ton Hydraulic puller and 24 Ton Tensioner. 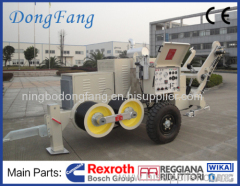 500KV Overhead Transmission Line Stringing Equipments are used for four conductors stringing, with 18 ton Hydraulic puller and 16 Ton Tensioner. 400KV Overhead Transmission Line Stringing Equipments are used for four conductors stringing, with 18 ton Hydraulic puller and 16 Ton Tensioner. 275KV Overhead Transmission Line Stringing Equipments are used for Two conductors or OPGW stringing, with 9 ton puller and 8 Ton Tensioner. 220KV Overhead Transmission Line Stringing Equipments are used for Two conductors or OPGW stringing, with 9 ton puller and 7 Ton Tensioner. 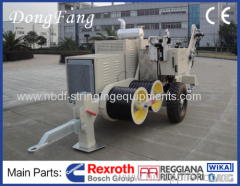 150KV Overhead Transmission Line Stringing Equipments are used for Two conductors or OPGW stringing, The set can be used in mountain area. 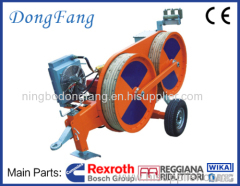 132KV Overhead Transmission Line Stringing Equipments are used for single conductor or OPGW stringing, The big set can be used in mountain area. 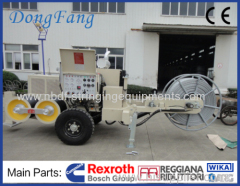 115KV /138KV OHTL Stringing Equipments are used for single or double conductors or OPGW stringing on HV line, The big set can be used in mountain. 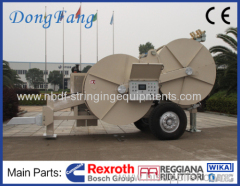 110KV Overhead Transmission Line Stringing Equipment is used for single conductor or OPGW stringing, the big set can be used in mountain area. 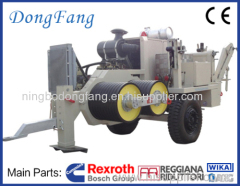 66KV Overhead Transmission Line Stringing Equipment is composed of 4 ton puller with tensioner, and accessory tools for single conductor stringing. 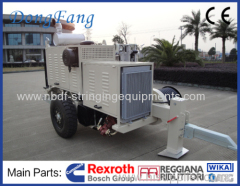 33KV Overhead Transmission Line Stringing Equipment is composed of 3 ton puller with tensioner, and accessory tools for single conductor stringing. Overhead Transmission Line Stringing Equipments are used for conductors or OPGW stringing, 220KV using 9 Ton puller with 8 Ton tensioner. 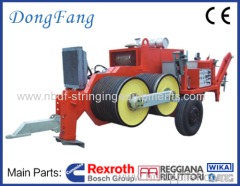 Group of Transmission Line Stringing Equipment has been presented above, want more	Transmission Line Stringing Equipment and Overhead Transmission Line Stringing Equipment, Please Contact Us.